As the level of distrust and alienation between Jews and Palestinians has risen over the past fifteen years, the support for grassroots organizations' attempts to bring these two groups closer has stagnated. Jewish-Palestinian youth encounter programs that flourished in the wake of the Oslo Accords now struggle to find support, as their potential to create positive social change in Israeli society… is still unknown. 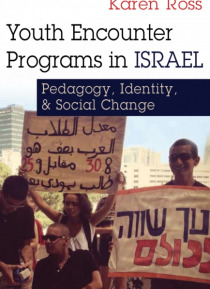 In Youth Encounter Programs in Israel, Ross attempts to assess that potential by considering the relationship between participation in Jewish-Palestinian encounters and the long-term worldview and commitment to social change of their participants. Taking a comparative approach, Ross examines the structure and pedagogical approaches of two organizations in Israel, Peace Child Israel and Sadaka Reut. In doing so, Ross explores how these different organizations shape participants' national identity, beliefs about social change, and motivation to continue engaging in peace-building activities. Based on more than one hundred interviews with program staff and former participants as well as more than two hundred hours of program observation, Ross's work fills an important gap in the literature and holds significant relevance for peace education and conflict resolution practitioners.